Cameron thought it would be fun today to dump every single toy OUT of the toy box and make the actual box the toy. 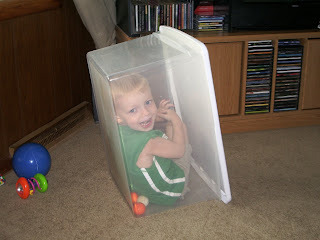 He and Colin had a grand old time playing "house" in there--they played for over an hour with this thing! 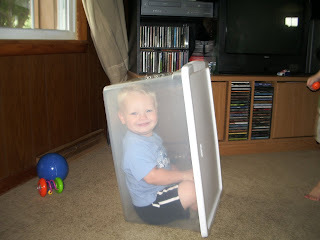 Isn't it funny how you can spend hundreds buying children toys (not that we have done that--most of our toys were gifts and garage sale finds--but I am making a point here) and the things they actually like playing with are like, cardboard boxes and tupperware containers? What is with that? 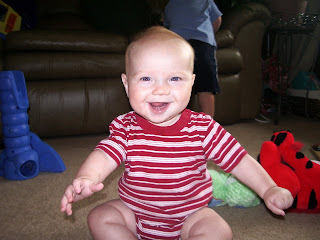 Ethan is killing me lately....he is just getting so big so quickly, it is nearing a depression stage for me! LOL He seriously does not have that 'baby' look to me anymore, but truly is looking like a little boy. He is just such a wonderful baby....all three of them are in their own way, you know? But there is just something about my Ethan. I am guessing that it is because he isn't backtalking me or disobeying me yet :-) but he is just so sweet. The three of them really do play well together. Colin is so great with Ethan. Cameron still is learning the "being gentle with the baby" concept, so supervision is still needed when the three of them are down on the floor together, but for the most part, everyone is included and they do great. Yesterday I came into the room to find Ethan--whom I had left sitting up in the middle of the floor--laying down on his back, with Colin next to him. Ethan's shirt was pulled up, and Colin was blowing raspberries on Ethan's belly! It was so adorable, and Ethan was laughing so hard. 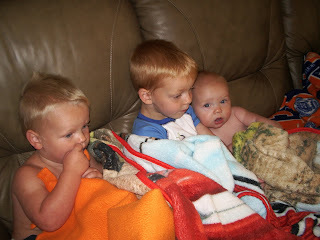 This is a shot of the boys from a couple of nights ago--Colin and Cameron were watching a veggie tale video before bedtime and Colin wanted to make sure that Ethan was included. He asked me if I would sit Ethan next to him, which I did. Colin promptly looked at Ethan, put his arm around him and said, "Want to watch with us buddy?" Awwww! I can't believe how much they all are looking so grown up! 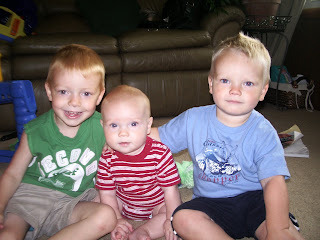 Cameron looks like a little boy now in the pics and ethan is getting so big! oh man..... looks like colin is a great big brother. they are so cute together! That is the cutest pic of them watching that video. 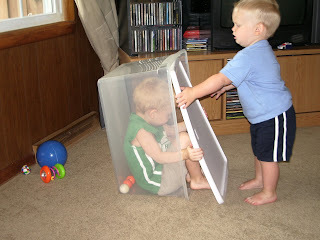 The more I see pic's like that the less scared I am to have more, it seems they get the hang of working and playing together quickly. I really do hope we can see you guys soon? Are you guys headed up to Roger and Lynette's this weekend? It would have been great to go, but Jay said he just couldn't take off anymore work.